There is no easy way to define the project, program, or portfolio management office (PMO). It’s this lack of clear definition that has likely held many organizations from taking advantage of the skills and expertise delivered by the PMO. At its most simplistic definition, the PMO is a team within the organization that functions to keep projects, programs, and portfolios on-track and focused. The PMO is the primary resource for all aspects of project portfolio management. With both an internal and external view of how the various projects within the organization impact both clients and team members, the PMO is best positioned to ensure organization success and value. With the changes in how most organizations are planning and delivering on their goals, moving from traditional waterfall or top-down management approaches to agile methodologies, we’re seeing increased demands for an active and visible PMO. With agile methodologies and project portfolio management moving outside the domains of software companies into a range of industries, the adoption of the PMO is the natural move. For all organizations, those with an established PMO or those new to the PMO, it’s important that the PMO is given the support required to be an effective and beneficial team. Project portfolio management and agile methodologies thrive on flexibility and change – it is these two core values that the PMO is directly responsible for. In having the ability and power to manage change to keep the organization relevant and responsive, the modern PMO Is crucial for organization success. Organizations and industry are not what they were five years ago. Driven by the fast-paced changes in technology and how this driver has forced evolution in how we communicate, work, think, live, adapt, and define success – organization and industry have been forced to adapt or get lost in the shuffle. This only further emphasizes why savvy organizations are realizing the value of the PMO to its overall success and relevance. As exciting as this technology-driven time has and is been, it hasn’t been all smooth-sailing for the organization as-a-whole. Change is hard. Adopting new ways of communicating, working with dispersed teams, delivering products and services, and in understanding the new challenges in competitive advantage – all place huge burdens on the organization. Adding in a new method of business management with the integration of a PMO, a project portfolio management system, and agile methodologies can create the perfect storm for chaos and break-down. All the more need for organizations to devote time and energy to creating, supporting, and maintaining a modern PMO. The pressure on the PMO to support the organization success is huge – and expected. To thrive, the modern PMO must have an active voice and be ready to embrace true business agility. Team focus. Know how to keep teams aligned to meet the organization goals. Manage growth. Know the project portfolio and how this is facilitates organization growth. Vocal voice. Connect with management and executive to ensure the project teams are supported and able to deliver on success. Management. Provide the expertise and guidance needed to meet deliverables. Motivated leadership. The strength of the project portfolio rests on the direction from the PMO. Understand change. Manage and communicate change effectively and smoothly. It is obvious that the modern PMO is not a secondary unit within an organization. An effective PMO is connected, communicating, and invested in the entire organization. When done right, project portfolio management and the modern PMO keep the organization aligned with overall goals and ensure that each unique group fits together into a cohesive connected team. The big question for the modern PMO rests on how to be modern – in other words, how to effectively support, drive, and guide the organization. As we all know, the brute force methods tied to rigid processes and schedules, simply does not work. To be effective and truly modern, today’s PMO has to look beyond the process and focus on goals and results – knowing the best ways to realize this within the existing organization. Real project alignment. The focus must be on using project portfolio management to support organization success and limit risk. The better aligned the organization, the lower the risk and the higher the return on investment. Allow flexibility. The foundation of agile and PMO success comes with being able to change and adapt when it makes sense. It’s important the PMO doesn’t get caught up in change for the sake of change. A respected voice. The PMO must be given the opportunity to drive and guide projects. Support the PMO with the right tools, knowledge, and respect needed to deliver on project growth and success. Collaborate always. 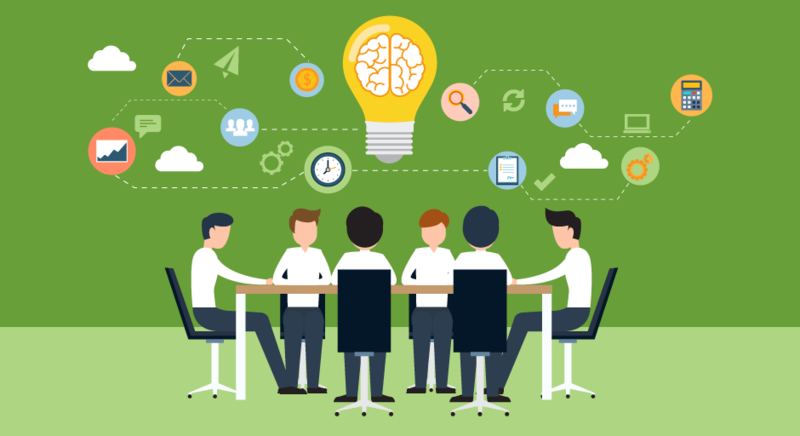 Collaboration and communication are keys to agile and project portfolio management success. Encourage open discussion, debate, and real team collaboration on projects. Support information and data sharing across teams to encourage strengthened projects. Know the teams and the projects. The modern PMO must be central to the organization, in knowing the teams and projects and how these are tied to resource allocations and deliverables. The granular and big picture serve the PMO to deliver on organization success. Yes, there is a lot expected of the modern PMO. However, with organization support and the right approaches to business management, PMO success and relevance can be realized. Just as the transition to project portfolio management systems and agile methodologies – building a modern PMO takes time and commitment. Know that the efforts made to build and support your PMO can and will make project execution and portfolio delivery a reality for your organization.